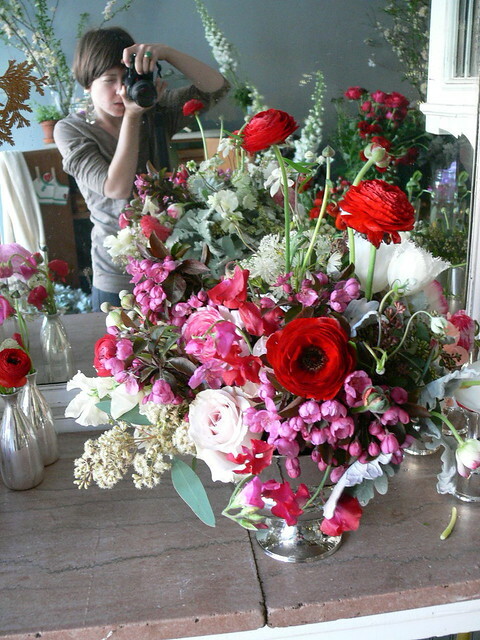 The florists curse; can't sleep in. Exhausted this morning and filtering back through my photo library working on my portfolio. Should have kept my hair short. But it's as when you wait a long time for the bus and consider just walking instead... the longer you wait, the more you're invested in waiting. Currently living in the purgatory of hair styles. Ha! I know exactly this purgatory of hair styles. I am in one, too. WHY can't I wear my hair short one day and long the next? Why? Oh, and from experience... don't pull your gray hair out. It will grow back short and defiant and stick straight out like and antenna. i think you looked cute ... maybe even cutER ... with short hair. i am cutting mine soon enough. sick of pony tails. they are so boring. lovely flowers, btw ! 1.) re: hairstyles, BEEN THERE. But pixies *are* expensive to maintain, I'll say that about short hair. Your loved ones create one small heaven on earth for you, and just a treasured gift is enough to bring a smile on their face. Visit www.rightflorist.com for more info. I need to stop waiting and just do it! At Gifts-To-India.Com you will have a bit tough time. Do not panic, because we have so many collections that you will wonder which one to pick and which one to leave. To my mind one and all ought to look at this.